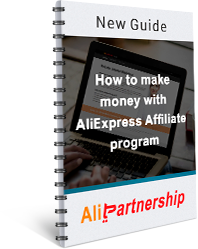 “So far I was lucky to make around $470 from Aliexpress Affiliate Program since the first day of participating in it as a means of earning money online in 2014. About two thirds of that chunk was generated within the last half year. AliExpress Affiliate program is not my largest income source. I am also involved in eBay and Amazon similar programs which I started using a long time ago in 2004. The long time period of usage gave me a lot of insight and experience and allowed me to make loads of money. On the other hand, AliExpress Affiliate Program was actually my first attempt of monetizing regional affiliate websites translated in different languages. I began to experiment with it in the October of 2014 (after rethinking my affiliate strategy and choosing new target markets to monetize). First, I created 15 blogs: 3 in Chinese, 8 in Spanish and 4 in Portuguese on Wordpress and hired two freelancers to do the work of content creation and distribution. Then I registered with AliExpress Affiliate Program and began manually adding AliExpress affiliate products onto them. This scheme of work was not as successful as I thought it would be, but I had enough side income from other projects which meant I could afford to wait a little longer. Besides, Amazon has taught me that patience and perseverance pay off in the end. This has been going for around 5 months when I finally decided to upgrade and create a webstore structure to support my blogs and import more affiliate products into it instead of a few there or a few here. The second case study is an affiliate website that generates $340 per month. It is a savvy-looking webstore that visually and content-wise differentiates from the standard amateur thin-content websites that the majority of 'bedroom affiliate marketers' create. Note: Just in case if you did not get it right away, the discussed websites are not touted as the kings among affiliates. You can make up an even better one if you have new ideas and passion. If you do not have a desire to spare some time and efforts on it, your earnings might be equal to $0. It is the potential of the affiliate program and dedication of an affiliate that count. You have to make a commitment to an affiliate website. Mr. Xiaobo comments: “My AliExpress Affiliate website offers original items, hip products and geeky devices across different categories that can be found around the AliExpress catalogue - gadgets, wearable items, food & drink, home and office, toys and more. Of course, it is NOT the only successful AliExpress affiliate website out there, but my web site targets very niche audience of stylish young people who care about the quality and brands of their clothes and devices. The website audience is different from those bargain-hunters that usually dwell in AliExpress. It is the one of the few affiliate websites that actually became dedicated to user experience and interaction with the website users by selecting the best products and ensuring great content. 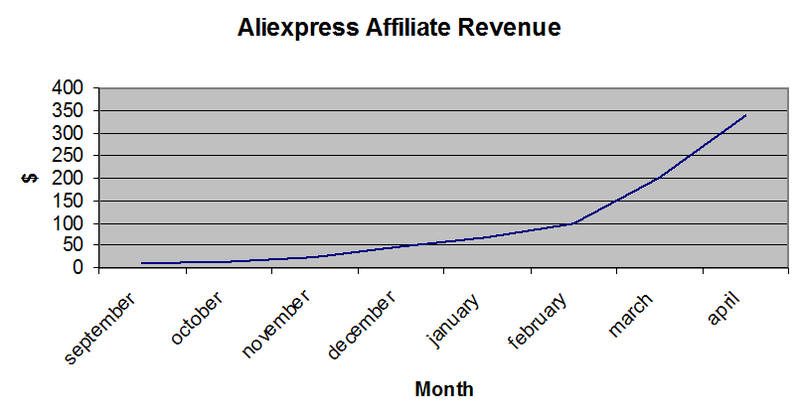 AliExpress is a new program that still holds niches for the aspiring affiliates. 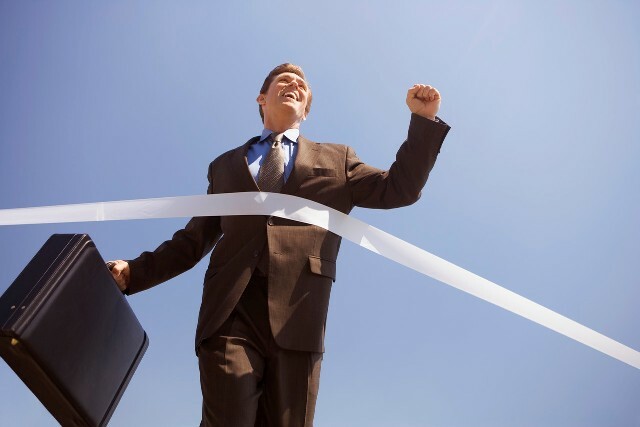 It provides more freedom, because it is not as crowded as other partnership programs. The overall trajectory has been positive and now the website generates $347. So what have I learned on the way to earning money from AliExpress? Althouth there are brilliant tools like Wordpress (the most popular CMS platform), Aliplugin (AliExpress plugin) and Buzzsumo (content search for rewriting), there do not guarantee 100% success. You have to embrace the method of trial and error and do a lot of experiments with your website design, content and marketing. What kinds of products are promoted on my AliExpress affiliate webstore? It is mostly cheap, but hipster or geeky, and sometimes seemingly useless and crazy products from space invader chairs to rain worms to jetpacks to bacon vodka. Since some of the wow products are popular and get out of stock easily, I was obliged to check each product whether it is still available for an affiliate program or not. Alipartnership Aliexpress plugin measurably simplified the process by updating the products automatically. From that moment I could dedicate myself to other things such as customization of the website design and content creation to generate the 'wow' effect. "The last month my AliExpress Affiliate webstore has finally reached an adequate amount of earnings that I hope will grow in the future. I earn an estimated $800+ per month from AliExpress alone which accounts for 89% of my income. This is not counting income generated from Google Adsense and the sale of my own products that were promoted on the blog of the website. AliExpress is the main affiliate program I link to, because it is the best fit for Latin America which is my target audience. My roots have prompted me to create an Affiliate website that would solve the problems of Latin Americans and Spanish-speaking communities out there by providing affordable clothes and gadgets imported from China. Since I already know Spanish and Portuguese I did not have a problem with creating original content for my readers – I just took popular fashion and high-tech articles from high-ranking blogs in English and translated them in the above languages. Social media promotion was also useful for generating new traffic, building trust and improving communication. Somehow the website visitors felt more at home on social networks: commented a lot, while the interaction on the blog posts was not so hot. One major reason for this is the plaza culture in Latin America. Cities in Latin America have many plazas where people gather and share stories, opinions and just enjoy each other's company. This culture translates easily to the digital world in the form of social media. A high value is placed on relationships in Brazil, if you are too brisk and concise in your answers when communicate with the local market, you can get a bad reputation. Make a thorough research of the countries to geo-target properly. This means create blogs or social media accounts in Portuguese for Brazil, and then another set for the Spanish-speaking countries. - Spanish is the official language in: Argentina, Chile, Colombia, Uruguay, Venezuela, Guatemala, Honduras, El Salvador, Nicaragua, Costa Rica and Panama (although many citizens also speak one of several Amerindian languages). Ecuador has Castilian Spanish as its official language. - Bolivia and Peru have three official languages, Spanish, Quechua and Aymara. Paraguay has two official languages, Spanish and Guarani. - Portuguese is the official language of Brazil. Here is a chart from de.statista.com that can help you choose the most relevant networks. If you still do not have accounts on Ask.fm or Pinterest, it is better to create a few. Contextual links in the blogs proved to be slightly more efficient than other links or banners. By all means experiment with the customization of the themes AliPlugin offers to you – if they do convert for you then more power to you – but in my case contextual links from within blog posts worked better. AliExpress offers a plethora of sales dedicated to different celebrations and festivals. It is highly recommended to keep an eye on them and notify people in time via blog or social media. There’s hardly a product on AliExpress that does not have a listed discount on it. At different times during the year AliExpress even runs special discounts and promotions on different product categories. Follow these kinds of promotions because they can be well worthwhile promoting (if relevant to your audience) and earn you a gratitude and trust of people."